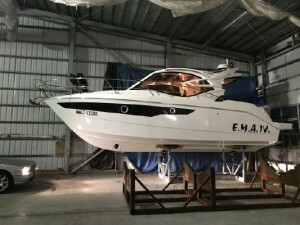 2016 Galeon 310 HTC found in excellent condition. This Galeon 310 HTC is for sale by the first owner and have only been used privately for two seasons. It has been stored inside a shed over winter and has the engine warranty until 2021. She comes with a good specification with many optional extras, including the Galeon convenience package, electronics package and luxury package. Confortable accomodation is provided in two cabins, sleeping 4 guests along with a heads with shower. This boat also benefits from Webasto heating. This Galeon 310 HTC is powered by a single Volvo Penta D4-300 300Hp inboard diesel engine, allowing for economical cruising.